Detective Case and Clown Bot in The Express Killer is an Adventure and Casual game for PC published by Nerd Monkeys® in 2018. A funny detective! A killer is killing passengers from the express train, and you as the detective , have to find out who is the murderer. 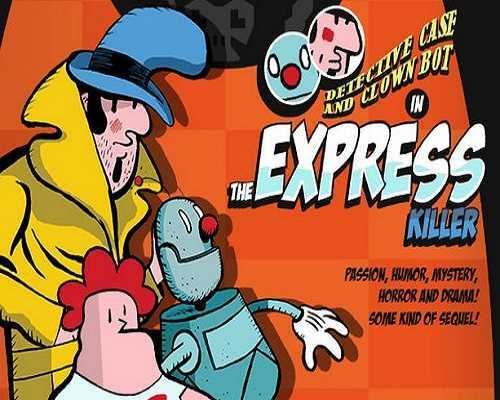 Detective Case and Clown Bot in: The Express Killer. The Express Killer is the sequel to Murder in the Hotel Lisbon. It follows the classic point and click adventure formula from the 80’s and 90’s. The game itself runs at a native resolution of 256×192, the same resolution used by the old ZX Spectrum 48k and the Nintendo DS. Synopsis: Someone has been killing passengers on the express train from Lisbon to Porto, every single day since Tuesday! Someone needs to stop the killer! Once again Garcia is not up to the task (was he ever?) and reluctantly calls upon his old friend and his strange flying sidekick: the mythical Detective Case and the unmistakable Clown Bot. Together, they will board on the express train, bother everyone by asking annoying questions, pick up everyone’s belongings and call them clues, drink and eat for free at the bar (because they are working after all!) and if all goes well, find and stop the express killer. Oh, and they have to babysit Garcia’s kid because his mom is in Porto and Garcia is busy and since they are taking the train to Porto they might as well take him with them. What could go wrong, right? Play as Detective Case and Clown Bot. Search for clues and interview witnesses. Crack witnesses in a demanding gameplay. 0 Comments ON " Detective Case and Clown Bot in The Express Killer... "